Here is all of the information about the very first Fountain Pen Day contest! The winner will win a TMLee handmade journal celebrating Fountain Pen Day 2012! Entry into the contest is simple and free. All that you have do is to write, draw or a combination of both, something about fountain pens. Submit your work to us, and we’ll open it up to the community to vote on what work they think is the best! 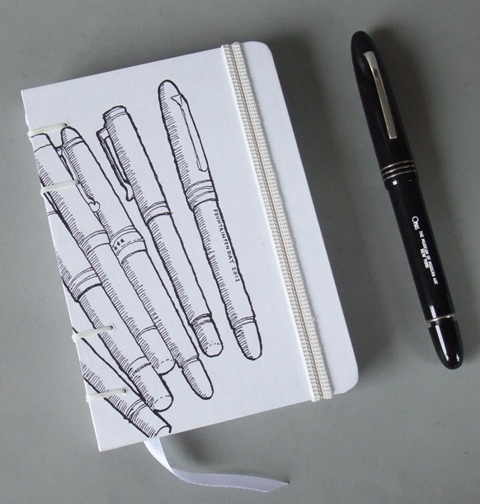 The first place prize will be a TMLee handmade journal commemorating Fountain Pen Day 2012. The top 10 entries will earn their work displayed on FountainPenDay.org for the next year! Entries will be accepted up until 11:59pm EST. on Sunday, October 28, 2012. Once all the entries are in and displayed on the site, we will open up voting. Voting will last until 11:59pm EST on November 1st, 2012. 1. A fountain pen must be used (of course) to create an entry about fountain pens or for the use of fountain pens. 2. Each person may have one entry. 4. Entries will be accepted until 11:59pm EST on October 28th, 2012. 6. We will announce the winner on November 2nd – the 1st ever Fountain Pen Day.